The bargaining team for the Chicago Teachers' Union unanimously rejected a contract offer from the Chicago Board of Education in an important vote Monday. The union's 40-member team said the proposal "does not address the difficult conditions in the schools, the lack of services to our neediest students or address the longer-term fiscal crisis that threatens to gut public education in the city." Members said they have "legitimate distrust" of the district and decided not to send the proposal to the full union for a vote. "We are not convinced that they will make good on their promises set forth in this proposal that are very vague and not clear," said Chicago Public Schools teacher and bargaining team member Monique Redeaux-Smith. The latest proposal was a four-year deal. 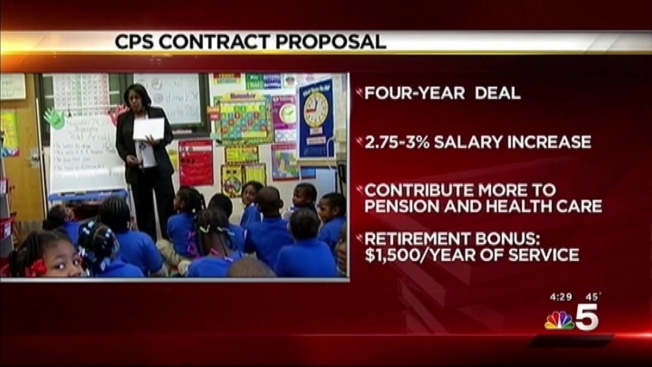 It included raises of 2.75 percent next year and three percent for each of the following two years. But on the flip side, teachers would have been required to contribute more to their pension fund and pay a portion of their health insurance premium. CPS also threw in retirement bonuses of $1,500 for each year of service in an effort to encourage some long time teachers to step down. The district was looking for 1,500 teachers to retire. If that doesn't happen, the contract would get reopened for renegotiation in July. CTU President Karen Lewis had earlier said she was hopeful about the proposal, but said in a statement Monday union members have given more than $2 million back to the district in the last five years and argued the financial struggles CPS faces are a revenue-based issue. CPS CEO Forrest Claypool said the offer would have prevented midyear teacher layoffs. Claypool has made it clear the city wants to eliminate a decades-old agreement in which the district pays 7 percent of the teachers 9 percent contribution to their pension fund. According to Catalyst, a public education watchdog -- CPS didn't budge on that pension pick up demand in its proposal. In return, the teachers would have seen a reduction in testing, more autonomy in grading and reduced paperwork. Sources told NBC5 that both House Speaker Mike Madigan and Senate President John Cullerton met privately with Lewis in the past two weeks. The district is currently facing a $500 million budget hole and recently announced hundreds of layoffs to its central office and administrative staff. The possibility of teacher layoffs also remains. Last week, Republican lawmakers proposed legislation that would allow the state to take over CPS and give the financially struggling school district the opportunity to claim bankruptcy. The plan was strongly opposed by CPS, CTU and Mayor Rahm Emanuel, however.